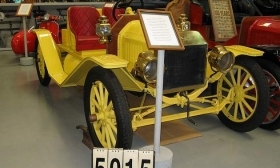 Kruse Inc., the auction company that sold the famous William Harrah car collection and has been synonymous with auctioning enthusiast automobiles since the 1970s, has lost its licenses in its home state. The Indiana Auctioneer Commission ruled this week to revoke both of Kruse Inc.'s licenses, and the company has to wait seven years to apply for new ones, said Kelly Butters, a spokeswoman for the state's Attorney General's Office. Dean Kruse, president of the auction house, has had his personal license suspended indefinitely. He can apply for reinstatement in two years. He and his company were fined a total of $70,000. A message left at Kruse Inc. was not returned. Kruse has appeared to have faced trouble since last year, when reports surfaced of consigners at auctions not getting paid for the sales of their cars and buyers not receiving their purchases. Dean Kruse told AutoWeek last summer the weak economy and cash-flow problems had led to financial woes for his company. The ruling marks a stunning fall for a company that helped grow the popularity of auctions and collecting cars among enthusiasts. Along with selling the Harrah collection for $41 million spread out over three auctions, Kruse claims to have sold the first car to have brought in $1 million in cash, a 1934 Duesenberg. Dean Kruse has presided over more than 5,000 auctions, the company Web site says. He also is known for an impressive personal collection. Terms of the ruling are not final but have been agreed on by Kruse, his company and state officials. A written ruling is expected as soon as this week. It's unclear what the ruling means for Kruse's auctions in other states. But the company and its president cannot auction cars in Indiana or use those licenses elsewhere. Kruse held auctions in Arizona, Florida and Alabama earlier this year. Additionally, the Indiana ruling orders Dean Kruse to submit quarterly reports certified by a licensed accountant to the auction commission showing payments to consigners. If he applies for reinstatement and gets his license back, he has 18 months to have paid off all claims and civil penalties.